Dec 7th, Dallas, TX--Jim Blyth Morning Radio Show, 9 to 11, KBDT 1160AM, "Alliance 4 the Brave." Dec 5th, Dallas, TX—Navy League Dallas, "Justice Again Denied Kimmel--This Time by BCNR"
Jun 19th, Sandy Springs, GA—"More Stories Within The Pearl Harbor Story"
Mar 30th, Providence, RI—Rick Adams Radio Show Interview of Tom Kimmel, "Soviet Spies and Pearl Harbor"
Dec 7th, New Orleans, LA—SDPHS National Convention, "What Marshall & Stark Didn't Know & When They Didn't Know it"
Oct 16th, Williamsburg, VA—William & Mary College, CWA 2nd Appearance, "Stark's Treatment of Kimmel; Marshall's Profound Error; BCNR Update,"
Apr 10th, Cocoa Beach, FL—Video: "Administrative Action to Remove Injustice in the Rear Admiral Kimmel Matter"
Apr 6th, Naples, FL—Naples Rotary Club, Pelican Bay, "How & Why Admiral Kimmel was Manipulated into Retirement"
Feb 12th, Naples, FL—USNAAA SWF (Naples) Chapter, "Admiral Stark's Missed Opportunities to Tell the Truth"
Jun 20th—SPECIAL PRESENTATION: "76th Pearl Harbor Attack Anniversary Year Update"
2. 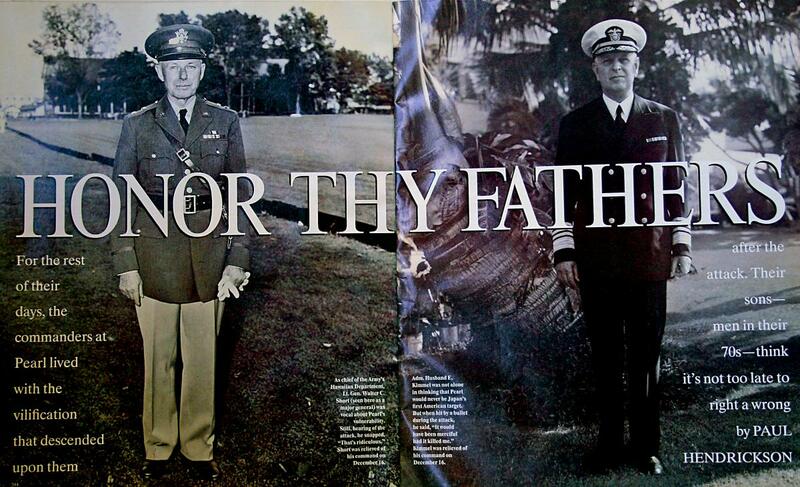 "The Story Within the Pearl Harbor Story." Apr 6th, Naples, FL—Naples ROA, "The Persistent Refusal to Analyse the Causes of Pearl Harbor Happenings"
Nov 2nd, Williamsburg, VA—William and Mary College, Christopher Wren Association (CWA) 1st Appearance, "The Story Within the Pearl Harbor Story"
Saturday, 09 May 2015, 11:30am-2:00pm - Melbourne, FL - Pearl Harbor Scholar Thomas Kimmel addresses AFIO Florida Satellite Chapter on "The Story Within the Pearl Harbor Story." Thomas Kimmel is a graduate of the US Naval Academy, former Special Agent of the FBI and grandson of Admiral Husband E. Kimmel, Commander of the Pacific Fleet on 7 December 1941. Admiral Kimmel was, says Kimmel, shamelessly scapegoated, reduced in rank, and disgraced after the Japanese attack. Kimmel comes from a family of distinguished scholars and government servants dedicated to protecting America, so Tom found it particularly troubling that his grandfather was accused from the well of the House of Representatives for having failed to prevent both WWII and the Cold War. Tom has devoted years of his life to the study of the topic, and uses these speaking opportunities to respond to the allegations. Tom Kimmel served on three warships during the Vietnam War and attended John Marshall Law School before beginning his FBI career in 1973. He served the FBI and the nation with distinction for 25 years, investigating organized crime in Cleveland, serving on the House Appropriations Committee Surveys and Investigations Staff at CIA Headquarters, and ending his FBI career as Assistant Special Agent in Charge of the Philadelphia Division, heading the Foreign Counterintelligence and Terrorism Programs during the first attack on the World Trade Center in 1993. Since retiring, Tom has served, as well as in other capacities, as a consultant to the Bureau on major spy scandals at both the FBI and the CIA. Location: Indian River Colony Club, At Ease Club, 1936 Freedom Dr, Melbourne, FL 32940. Jun 18th, Atlanta, GA—World War II Roundtable: Pete Mecca's Covington News Article, "A Veteran's Story." Tom Kimmel Atlanta World War II History Round Table YouTube Video, 6/18/15. Nov 2nd, INTERNET—I-NExT Kiwanis Club, an Internet club. Dec 5th, Wilmington, DE—Wilmington Rotary Club, Hotel DuPont: "Vindicating the Scapegoated 1941 Pearl Harbor Commander Adm. Husband Kimmel"
Dec 12th, Minneapolis, MN—Dr. Harold C. Deutch World War II History Round Table.